KEY Insurance Company , for the year ended December 31, 2017, reported a 50% increase in net premiums written to $293.58 million from $195.21 million. 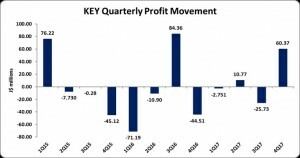 For the year end, the company, reported a 44% increase in net premiums written to $930.30 million from $645.87 million. This was as a result of a 33% increase in gross premiums written from $1.08 billion to $1.44 billion. Reinsurance cede for the for the year rose 17% to close at $509.77 million (2016: $435.88 million). For the quarter there was a 12% increase from $101.48 million to $113.64 million for reinsurance ceded, while gross premium written experience a 37% increase year over year to $407.22 million (2016: $296.70 million). KEY booked change in unearned premium reserve of $151.65 million relative to $111.83 million last year. As such, net premiums earned increased by 46% totalling $778.65 million versus $534.04 million for the comparable period in 2016. Net premiums earned for the quarter amounted to $230.47 million (2016: $140.02 million). Changes in insurance reserves for the period declined from $42.96 million in 2016 to $14.74 million in 2017. The company reported $141.40 million for commission on premium written relative to $101.91 million for the comparable period of 2016, this represents a 39% increase year over year. Commission on reinsurance ceded totalled $91.30 million relative to $78.29 million in 2016. Claims expense totalled $334.06 million, down 68% from the $1.04 billion recorded in 2016. A loss of $51.59 million was recorded for Reinsurance recoveries, while administration and other expenses inched up 5% to close at $428.81 million compared to $410.10 million recorded in 2016. Change in unexpired risk reserves for the year closed at $8.12 million. There was an underwriting loss of $63.04 million for the year compared to a loss of $125.18 million reported in 2016. Underwriting profit for the fourth quarter amounted to $8.67 million versus a loss of $57.94 million for the corresponding quarter of 2016. Investment income for the period amounted to $49.41 million compared to $42.29 million in 2016. Other income for the year amounted to $38.67 million relative to $20.28 million in 2016. KEY noted, “the increase was as a result to the $36 million gain on available-for-sale equity securities disposed of during the year. This was however, offset by a $22 million reduction in foreign gains due to the relative appreciation of the Jamaican dollar.” Key booked $19.70 million for gains on revaluation of investment properties in 2017 versus $12.05 million for the year ended December 31, 2016. Following a tax credit of $2.08 million (2016: $8.33 million), net profit for the year closed at $42.66 million compared to a loss of $42.23 million. Net profit for the quarter amounted to $60.37 million versus a loss of $44.51 million. Earnings per share (EPS) for the quarter amounted to $0.16 relative to loss per share of $0.12 in 2016. The EPS for the year totalled $0.12, relative to a loss per share of $0.11 booked in 2016. The stock is closed the trading period at $4.65 as at March 29, 2017. The number of shares used in the calculation was 368,460,691 units. The company’s total assets amounted to $2.45 billion as December 31, 2017 up from $2.42 billion in 2016, representing a 1% increase. The overall growth in the asset base was attributed to a 41% increase in investment securities which closed at $713.22 million (507.48 million). Total Stockholders’ Equity as at December 31, 2017 was $1.10 billion (2016: $1.02 billion), resulting in a book value of $2.99 (2016: $2.76).